Its major export partners are American Samoa and Australia. Its main exports are fish, coconut oil and cream, nonu, and copra. Its major import partners are Fiji, New Zealand, and China. Its major imports include machinery and equipment, industrial supplies, and foodstuffs. Located in Oceania, Samoa is an island nation. It has a 403.00 km coastline. Samoa is an Oceanian country covering 2,831.00 km2 of which 0.35% is water and 2,821.00 km2 is land. This makes it the 29th smallest country in the world and slightly smaller than Rhode Island. Its geographic coordinates are 13 35 S, 172 20 W and Apia is the capital city. The name "Samoa" translates into "Holy Center". Its ISO code is WS. 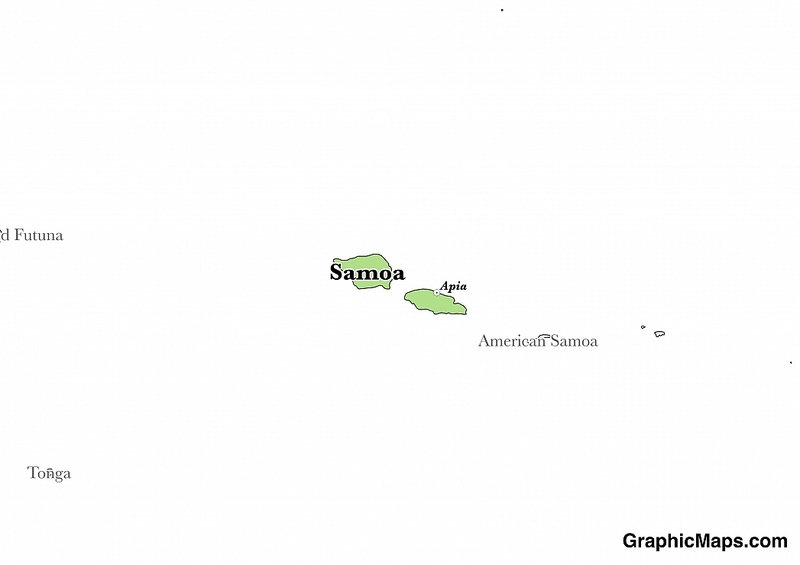 Samoa has a mean elevation of 0 m above sea level. It has a Mediterranean climate with mild winters and warm summers. Its terrain is mostly volcanic and rugged. Samoa has a population of 198,926 making it the 183rd largest in the world. Samoan is the official language spoken. The majority of the popupulation is reported as having Samoan ethnicity. The majority of the population is Roman Catholic. The Independent State of Samoa has two official languages: Samoan and English. The indigenous language comes from the Austronesian linguistic family of Polynesian languages. The vast majority of Samoans cite Samoan as their mother tongue. Estimated figures from 2005 count the total number of Samoan speakers on the islands to be 246,000 which represents about half of the total of Samoan speakers around the world. The dialing code for the country is 685. Samoa is an independent country. It gained independence in 1962, from New Zealand-administered United Nations trusteeship. Its constitution was last ratified in 1960. The Independent State of Samoa formally gained its independence from New Zealand in 1962. Since then the country has operated as a unitary parliamentary democracy. The Pacific Ocean island’s legislative assembly meets in Samoa’s capital city, Apia in a traditionally styled structure. The Legislative Assembly consists of forty nine members who all serve terms of five years in length. The nation’s two major political parties are the Tautua Samoa Party and the Human Rights Protection Party. Factoring in Purchasing Power Parity, Samoa's GDP is $1,046,000,000.00 (USD) with $5,400.00 (USD) per capita. This makes it the 202nd largest economy and its citizens the 160th richest in the world. The currency of Samoa is the Tala (WST). Its major export partners are American Samoa and Australia. Its main exports are fish, coconut oil and cream, nonu, and copra. Its major import partners are Fiji, New Zealand, and China. Its major imports include machinery and equipment, industrial supplies, and foodstuffs. The Independent State of Samoa, which is composed of two main islands and four smaller ones, is located in the South Pacific Ocean. Its flag was initially accepted for U.S. Trusteeships in 1949 and officially became the symbol of Samoa’s political independence on January 1, 1962. 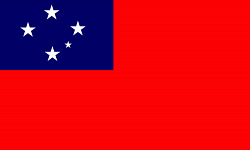 The design of the flag features a solid red background with a large blue rectangle positioned in its upper hoist side. Inside this flag is the familiar Southern Cross constellation which features five white stars; four large and one much smaller. Samoa’s official flag symbolizes courage, purity, and the freedom of its people. The use of the Southern Cross constellation also references the important relationship that the island nation enjoys with its larger neighbor, the country of New Zealand. Before adopting its current flag Samoa flew the flag of Germany, who colonized the island until 1914.